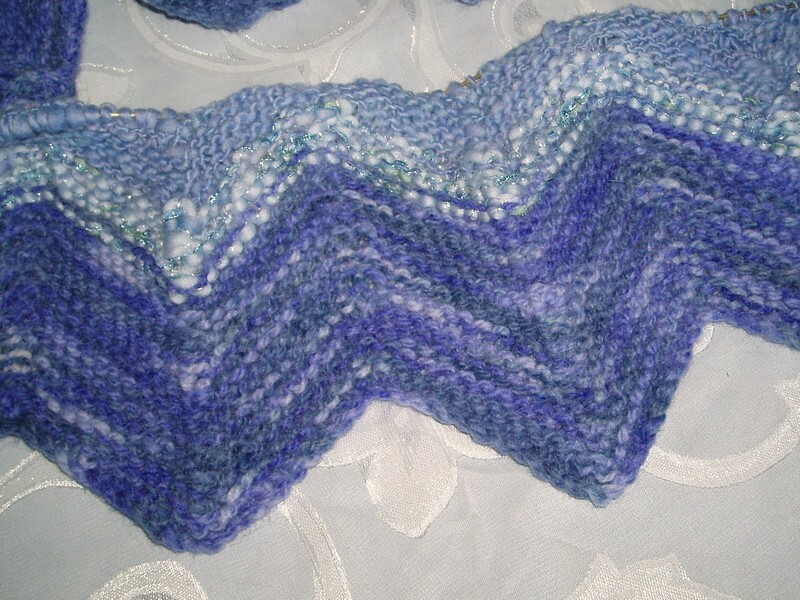 Well, the secret knitting is finally done for now, though it’s not un-secret yet. But, in secrets that are no longer, I got a package from my no-longer-secret pal today! This was an interesting swap, in that we weren’t allowed to spend any money other than shipping. 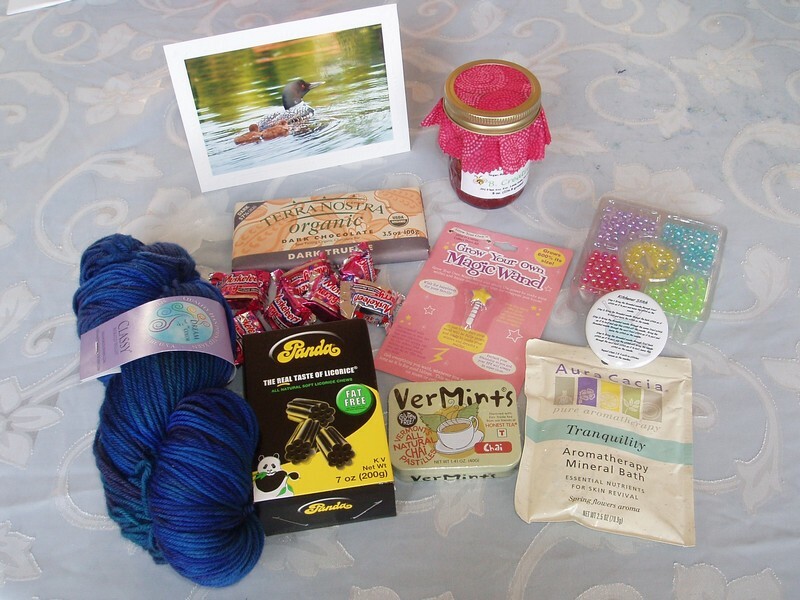 We sent yarn from stash, things we had crafted, etc. My fabulous pal, mugwump, sent me some yarn, some patterns, an adorable project bag which I think she sewed, and a knit hemp grocery bag! In fact, she did such a great job that she sent me a couple skeins of Melody (bottom left, 1st picture) in a color that I already have! 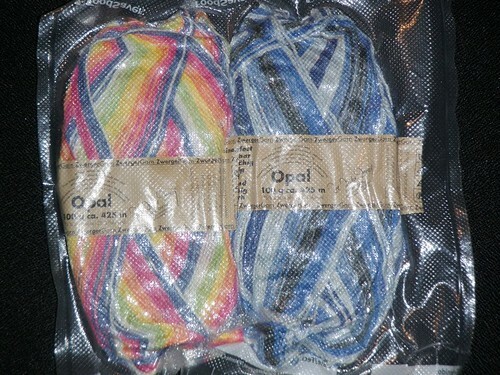 No worries as this month I’ll be sending her a package which will probably include some socks out of that very yarn! 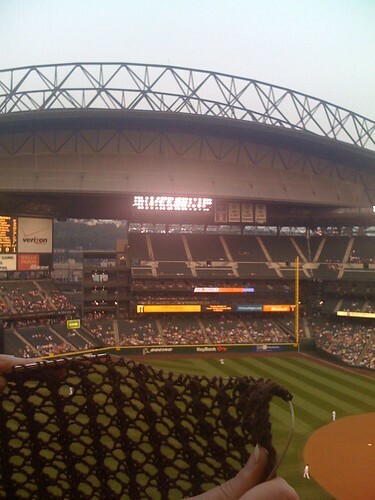 And, as for things that aren’t secret at all, I was at Stitch & Pitch on Thursday! My Summer Sox were the selected project, and I got quite a bit done! 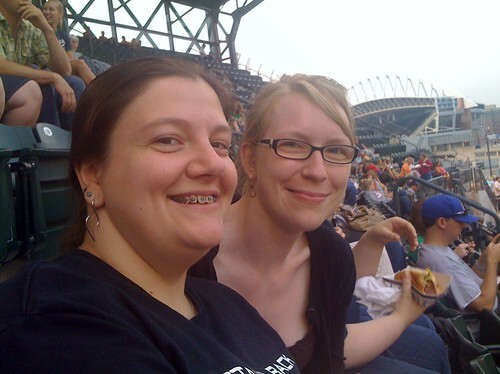 I also had fun with a few knitting buddies, including my friend Nicole who has never been to a baseball game! Sadly the game itself was extremely boring, with no runs for the first 6 innings. 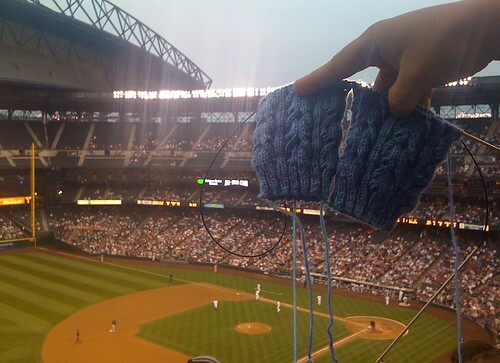 Good thing we had our knitting! Well, thanks to my V-day SP (again) I have something to post today too! 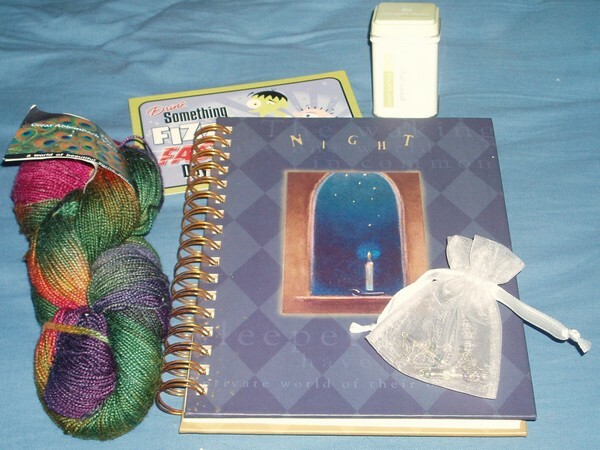 Clockwise in a spiral: A pretty handmade card, raspberry jam which looks delicious!, some beads to make a necklace / bracelet, a button describing the steps of Kitchener Stitch, a bath… thing (not salts, but something bath-y), chai flavored mints!, Panda licorice (Hey! Pandas! Was that a clue yesterday? 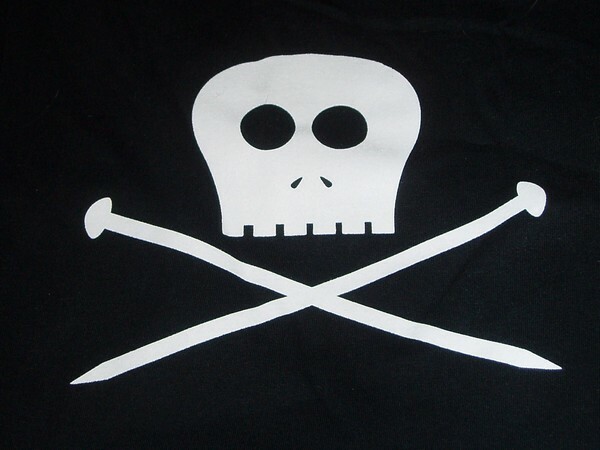 ), a skein of Dream In Color Classy in Night Watch, an organic dark chocolate truffle bar, a grow your own wand, with a star on it, cherry 3 Musketeers. My SP says a lot of the package is local to her area and where she spends the summers, which is a really cool idea. I’m going to the ocean with my family over Valentine’s Day this weekend so I’ll bring the licorice to share. I like licorice, but some of my family *loves* it. But that dark chocolate truffle bar is all for me! 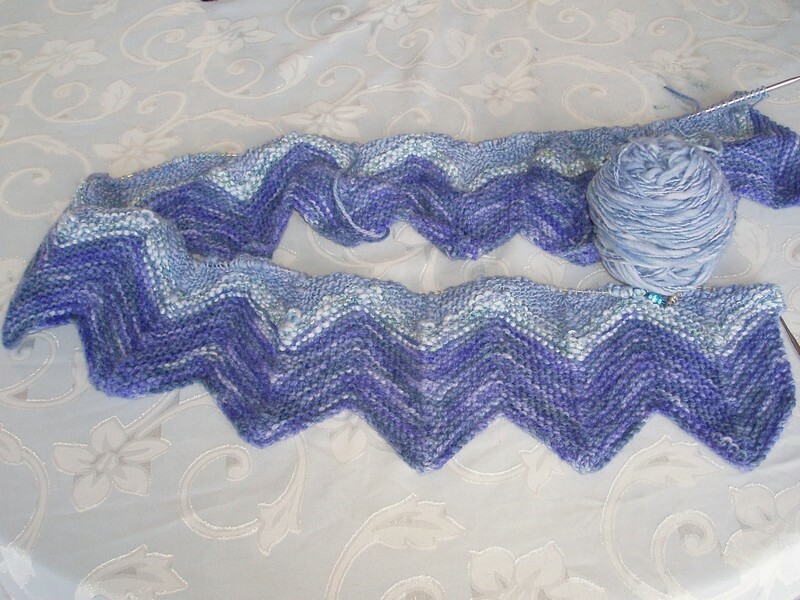 It’s my blanket for all my random blue and purple worsted weight – a lot of which was gifted to me by SPs. I figured it would be nice to have it all together in a big project instead of making countless hats and scarves. At the moment it’s looking pretty purple, though. Maybe this Classy should go in next. That middle stripe (Eskimo by Bouton d’Or, from a past SP) is actually a light blue, but the lavender above (Woolarina handspun, prize from the Knittyboard WIP-along) makes it look purple. You can see more details on the Ravelry project page. 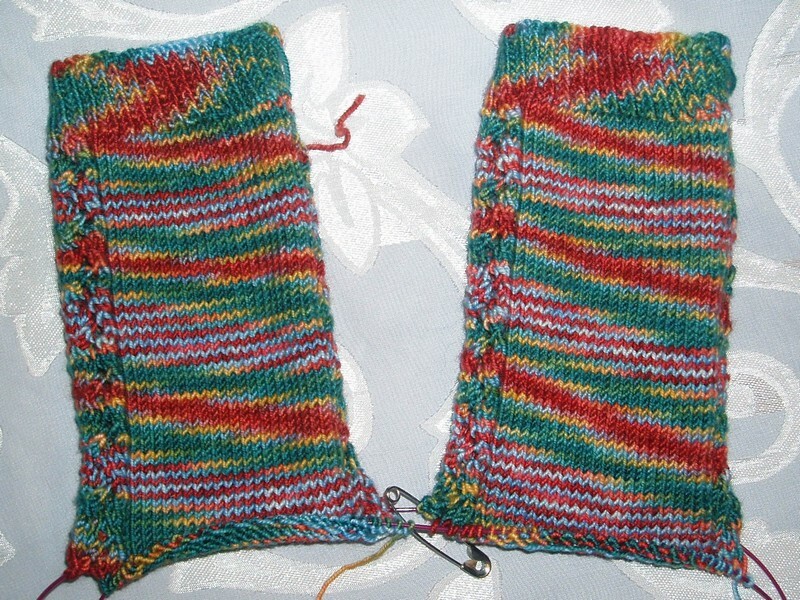 In other knitting news, I spent some time last night making Excel versions of the charts for a couple of patterns – Marble Arches from the 2006 Rockin’ Sock Club and The Mystic Sea from my first time at sock camp. I started these socks ages ago and had to rip them out because I couldn’t find my notes on pattern modifications or I forgot which size needles I used. I took screenshots of the charts and put them on my iPhone! I love my iPhone. Now I can start up the socks at home and not have to worry about carrying patterns with me when I take them to knitting group. 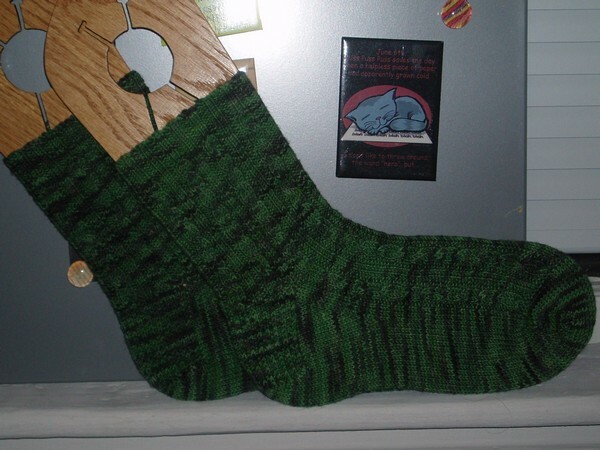 A while back I got some Flat Feet from my amazing SP Aspiring Crazy Cat Lady and started a pair of Undulating Rib socks with it, promising to chronicle the progress. 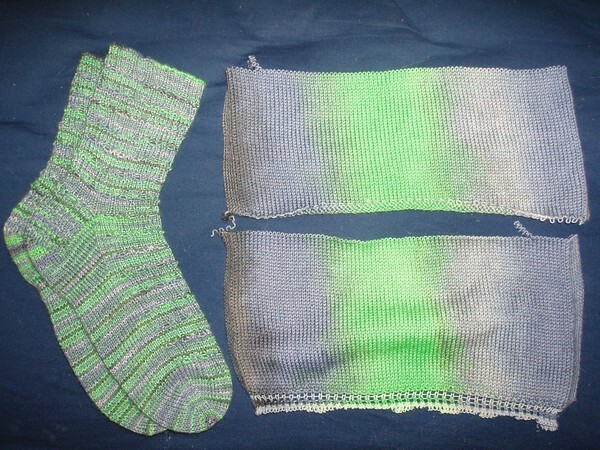 Well I fell down a bit on that last part, but the socks are now finished! 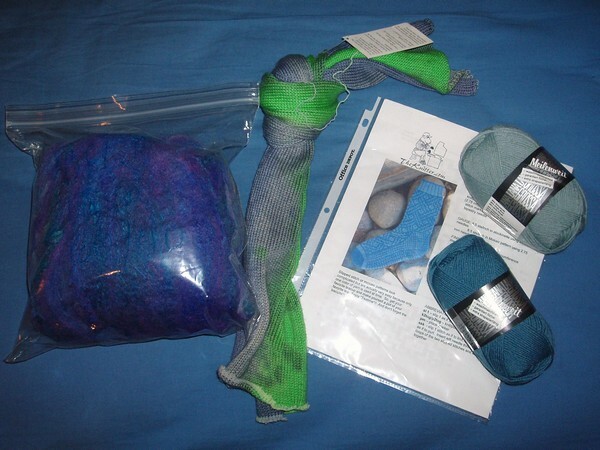 The yarn to the right is what was left – quite a bit actually. 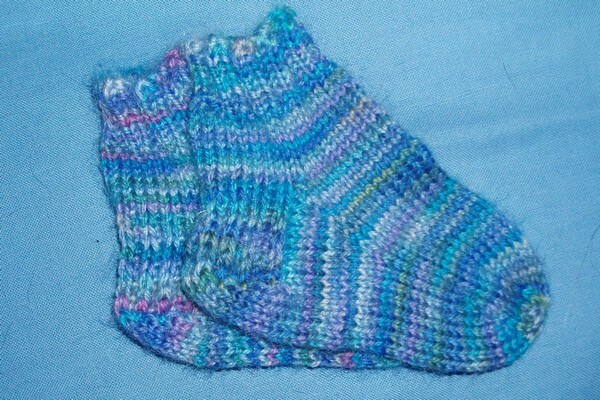 As you can see the Flat Feet didn’t knit up all that differently than any “normal” hand dyed yarn. It still has the characteristic spirals, as I said before this is probably because of the way this particular flat was painted. 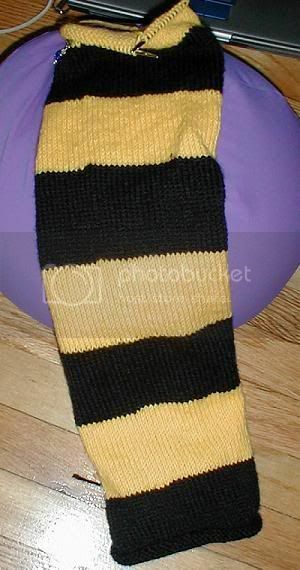 In any case it made a very nice pair of socks! Yesterday while in the throes of Sock Madness the doorbell rang – this can only mean one thing: mail. So I went downstairs and the mailman handed me a box and asked if it was yarn. (Hee hee.) I was a little embarrassed by the fact that the mailman apparently knows me so well, but I was actually not at all sure what was in the box. Turns out the mailman was right. 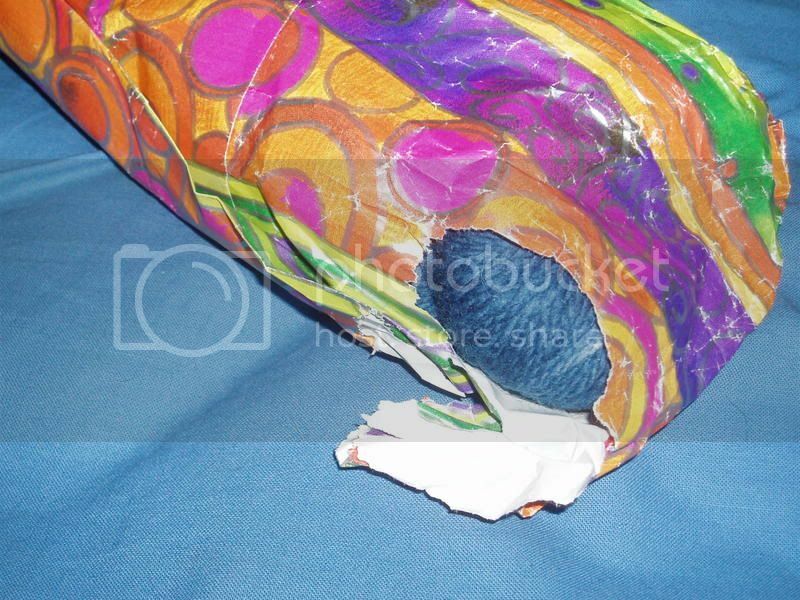 It was the final package from my super SP – Aspiring Crazy Cat Lady. 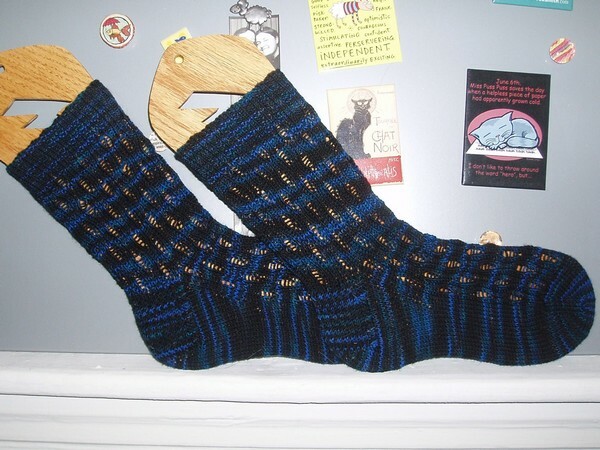 I got a neat mosaic sock pattern with two colors of blue Meilenweit. That definitely looks interesting and I think I’ll use it as packaged, just as soon as I get through some of my more complicated socks. 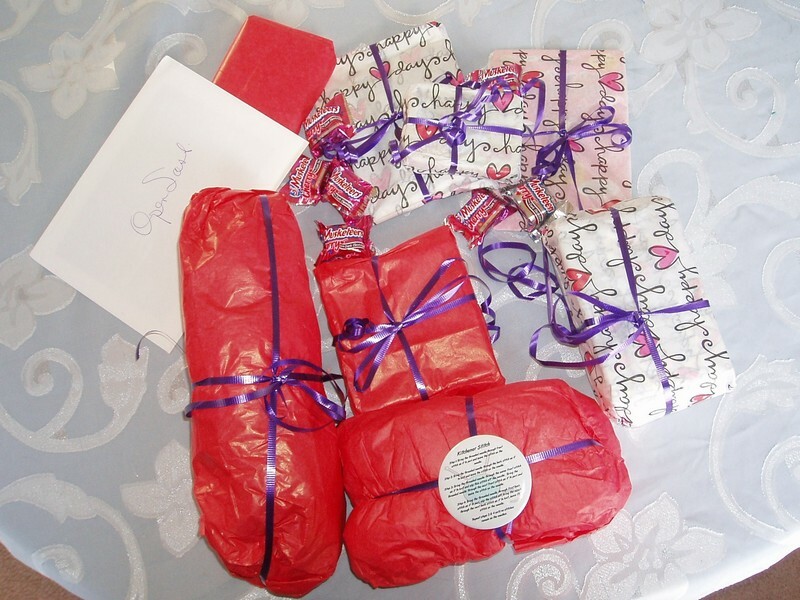 She also sent some hand dyed fiber that she “made” herself. Um, blended herself – that’s the word I’m looking for. It looks gorgeous! And last but certainly not least… I told her it was my dream to try some Flat Feet – and then when I saw it at SPA I had Cathy convince me not to buy any because I had faith in my SP to come through with the Flat Feet. And come through she did! I’m very excited to use it and it seems that a few knittyboard members are excited to hear about it so I’ll be starting those socks really soon and documenting the process. But I finished well before my division hit 40 so I’m into the next round. Well first off I really really like it. 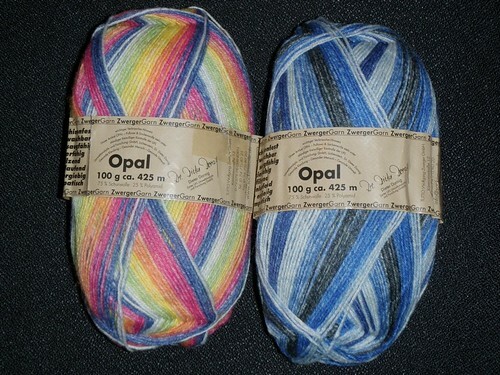 I’m putting this up front because I’m going to be comparing it to other yarns since many people haven’t had the chance to try – or even see and touch – it. But none of these comparisons are better/worse, they’re all just *different*. 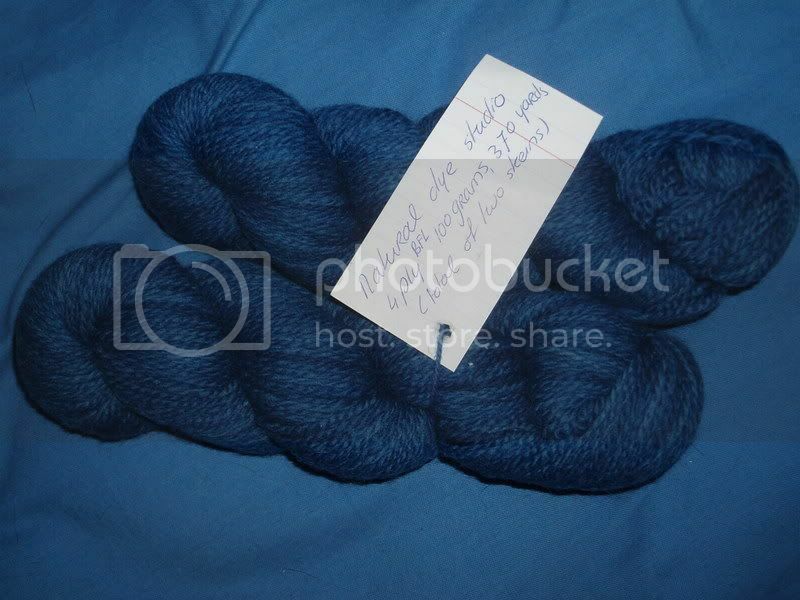 The yarn itself is much different than what I’ve come to expect from a handpainted yarn. It’s not a 2 ply or even a 4 ply, it’s an 8 ply. (I counted.) The multiple plies make it a little splitty, but a very little bit. It didn’t really bother me at all after I got used to it while casting on. 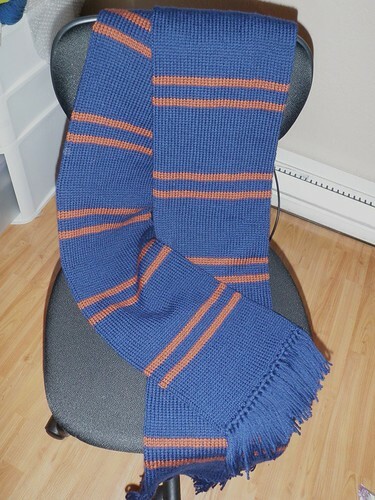 It looks very thin and doesn’t really feel soft in the skein. In fact it’s 100% wool but I never would have guessed it, I could have sworn there was some nylon in it. Although it looks very thin it doesn’t really compress at all – I used size 1 (2.25mm) needles and I think they were a good fit – the ballband recommends 2-2.5mm. The resulting fabric is nice and not at all holey*, flexible but I think it will be hard-wearing, and soft. The yarn is very dense, but not sproingy at all. I realize that sproingyness is a made up quality – but not by me, no idea who first coined the term – but I suppose most of you know what it is. (For example, Socks That Rock is a pretty dense 2 ply, and it’s very sproingy, Koigu is also a dense 2 ply but less sproingy.) Not exactly springy but more springy and dense combined? In any case… back to Wollmeise. The properties of the yarn aside, the dyeing is wonderful. The color I used has a very true black, something that’s hard to find in hand dyed yarn. The yarn was very evenly dyed and didn’t have any splotchy spots, and despite the very blackness of the black, the blue and teal-ish bits were bright and true. The skeins also come in 150g instead of 100g – and 574 yards. For me this is probably enough for 2 pairs of socks – I think I’ll use the remaining yarn for a toe up pair and see how far it goes. Yay for SPs and BFF socks! Friday I got another lovely package from my SP! 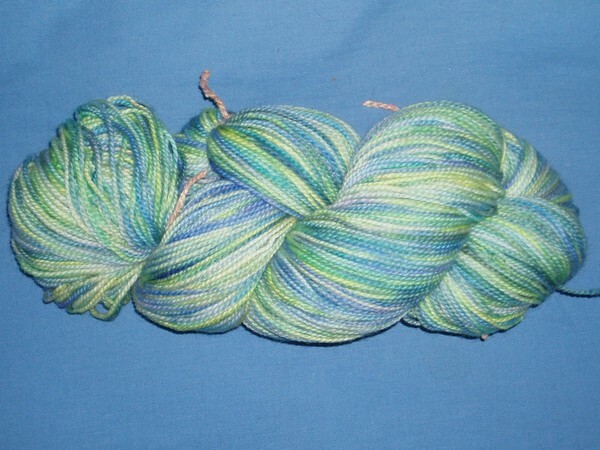 And the second part was some very pretty Spring yarn she dyed herself! Lots of exciting things happened in my knitting world today! I got my first SP package today for Knittyboard SP10. It has actually been sitting at the post office for a few days while I worked out a time to go pick it up when they were open. I got a cool Day/Night journal which has pages going both ways (you have to flip the book over for day or night) which is a very neat idea. 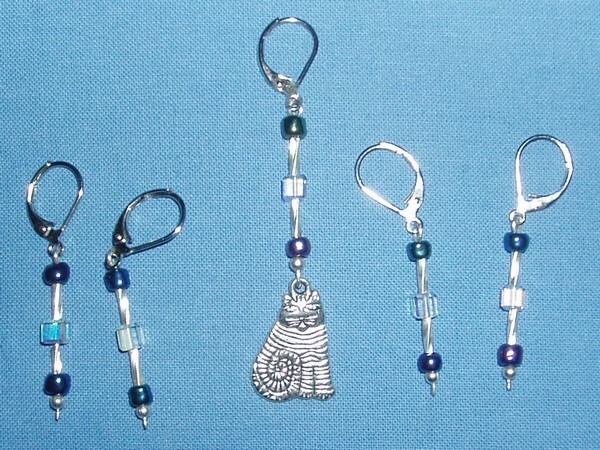 I also got some green tea, some Great Adirondack sock yarn, and some very cool stitch markers! They’re especially great because they’re the ones you can clasp on a stitch to mark for things like cable rounds and such – I always need more of those. Thank you Starlight Fairy!!! I’ll admit I also got some freakshow stationary. But no yarn! See, I’m being (kind of) good! 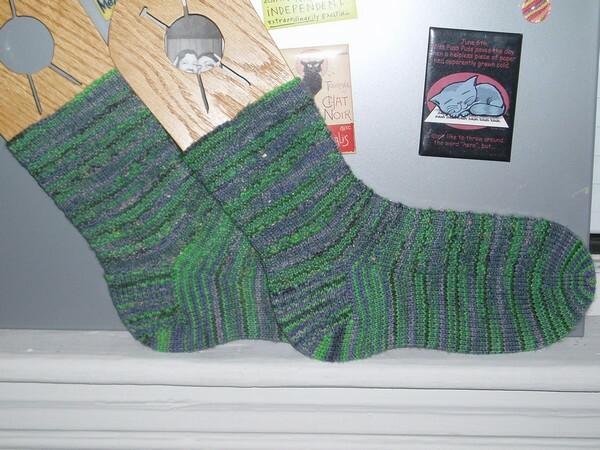 I worked on the BFF socks for Cathy and wanted her approval every time I did a cable twist round. I kept holding the socks towards her making little “eee” noises until she commented on their amazing beauty. I don’t know why, but I’m really excited about these socks. 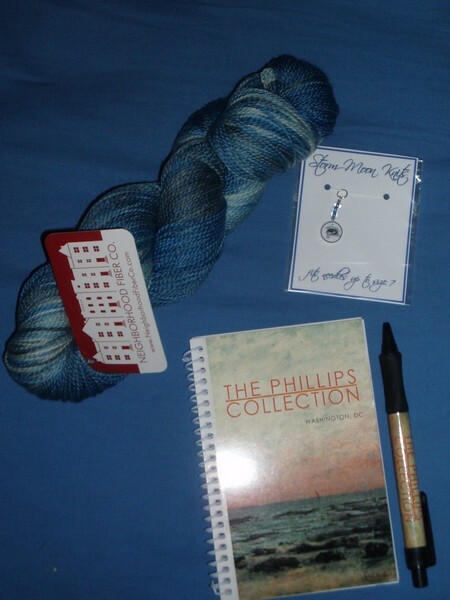 And when I picked up my SP package this morning I also got the first one from the Neighborhood Fiber Co. Sock Club! I was really excited about this one because I’ve never tried the yarn and I’m in luck because the first package is blues – my favorite! Secret Socks and Sea Socks! No, my SP’s feet are not that small, but she does have a newborn that I hear they fit quite well. I really love the colors of this yarn and the socks I got were very comfortable, but I did find it a bit splitty while working with it. Worth it, though! I’m going on Sea Socks ’08! I’ve been discussing a trip with my mom for a while, and we were going back and forth between Hawaii and Sea Socks to Alaska. I told her how I wanted to go on Sea Socks but none of my knitting buddies could go with me, but I wasn’t sure that she’d be interested in it. Now, my mom does know how to knit. In fact, she taught me the basics when I was a little kid. 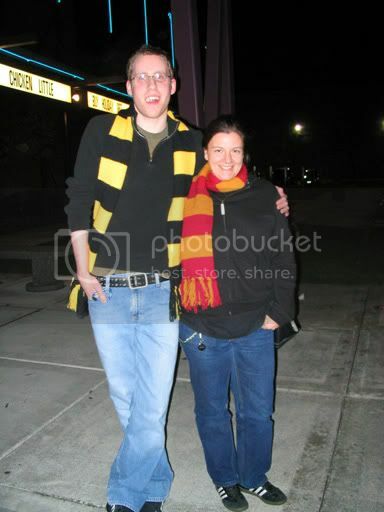 But she has never knit socks. (!) We already had plans to remedy this problem over Thanksgiving and now it’s even more urgent! Tonight while talking to her she said she’d like to go on the cruise, so we’re on! I’m very excited.